In Fall 2017, Best Western® Hotels & Resorts prepared to launch its 11th brand, BW Signature Collection® by Best Western. This new soft brand signified a major development for the iconic company, on the heels of its 70th anniversary, marking its entry into the upper midscale soft brand space. It also saw a development for the hospitality industry at large, filling a void that existed for upper midscale, independent hoteliers seeking a way to retain their individuality, while tapping into the offerings of a powerful legacy brand. 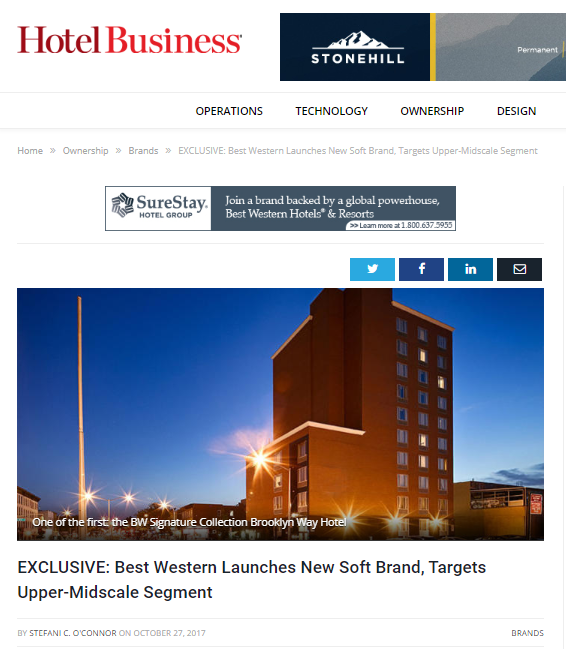 Best Western’s communications and PR team launched a two-fold strategy for sharing this news, offering one business travel media outlet an exclusive (Skift) and one hotel trade publication an exclusive (Hotel Business). The goal for the Hotel Business exclusive was to establish significant exposure for the launch of the soft brand within the industry, highlighting Best Western’s expanding portfolio to independent hotel owners, showcasing the new soft brand as the answer to their very unique challenges. The target audience for this particular story was hospitality industry professionals and independent hotel owners (prospective members). To launch BW Signature Collection by Best Western in a big way within the industry, the brand’s PR team started with Hotel Business, one of the preeminent hospitality trades. The team offered an exclusive interview with Best Western® Hotels & Resorts President & CEO David Kong to share the news of its latest brand, and Hotel Business accepted. From there, the team arranged the interview and helped craft the messaging for the story, which ran in October 2017 just before a broader media launch. BW Signature Collection by Best Western is the newest soft brand offering of the evolving Best Western Hotels & Resorts. The unique option answers the call for hoteliers who crave flexibility and individuality, yet desire the ability to tap into the infrastructure of a powerhouse brand. The exclusive offer to Hotel Business paid off, with a feature story running online just before the team’s broader soft brand media launch. The story reached 29,130 readers and ended on a powerful note, compelling independent hotel owners to consider Best Western: “This becomes a migration path for hotels that might consider leaving,” said Kong, indicating owners considering leaving other brands to go independent now have this Best Western option to consider when they jump.